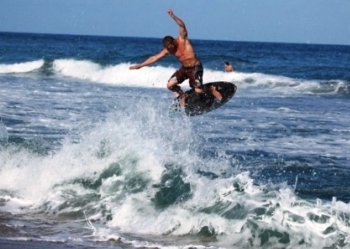 Surfing near Bucerias is great! With Punta de Mita only 10 minutes away and Sayulita about 25 minutes away, you can catch some of the best Mexico has to offer for waves! 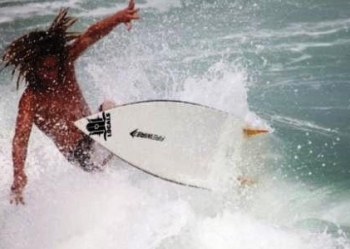 Surfing looks way easier than it is, so give the local surfers some credit for trying! Try your hand at boggie boarding too, theres fun for everyone. Boards can be rented at very reasonable costs or you can even get lessons (very valuable if you do not want to surf upside down)! Surf waves 4 - 8 feet high! Surfers - click here to see more information on where to surf, where to get the equipment, how to get to the best surf spots & what to expect for temperatures. Quaint little surf shop downtown Bucerias where you can gear up and take surf lessons. 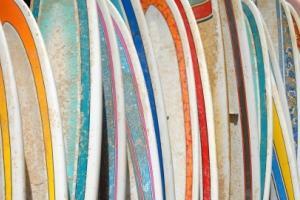 rent surf boards, equipment rentals and clothing.